I have just stumbled on an amazing fact. 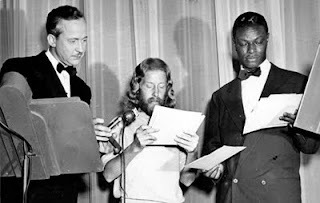 eden ahbez, the man who wrote "Nature Boy" a #1 hit for 8 weeks straight for Nat "King" Cole, was also a raw food hippie. This was in 1947! He is the prototypical hippie. A sort of Jesus figure that lived for a time under the "L" in the Hollywood sign. He died in 1995 after being hit by a car. His life though is an extraordinary story.